Every time you rest your feet on the pedals and head down the road, you’d feel something new, a feeling of great pleasure and a sense of freedom. However, as much fun as it is, getting into cycling is more than just buying a bike and heading down the street. You need to understand the basics first. You have to do your homework and understand your bike first when buying a good bike. There are many types of bikes and based on your style and preference, you can get a road bike or a hybrid bike. Finding the right bike is the key and you need to think ahead when trying to decide what’s right for you. Road bikes are all about fun and speed and they have been called the most efficient means of human-powered transportation. Road bikes are often confused with racing bikes because of the drop handlebar design that resembles racing bikes. While most racing bikes can be referred to as road bikes, some are not designed for riding on the road. They are so lightweight that you can pick them up with one finger. 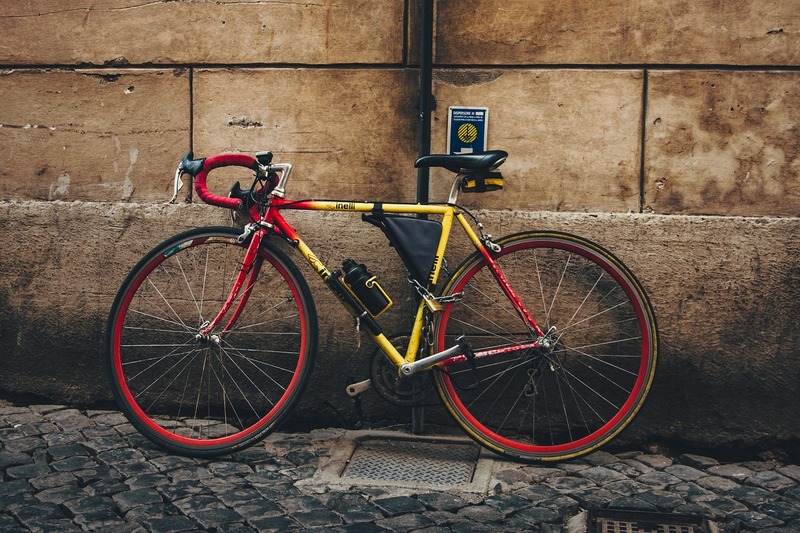 Modern road bikes come with 16 or 18 speeds and most of them are drop-handlebar derailleur bicycles specially designed for paved surfaces only. The bike’s geometry and dropped handlebars place your body in a position that will allow the muscles to work most efficiently, with minimal wind resistance. Hybrid bikes, as the name suggests, are a cross between a road bike and a mountain bike that offer the best of both. Hybrids have become immensely popular in recent years for their exceptional off-road capabilities. Hybrids came along when MTBs started getting more specialized and updated for more challenging conditions. They typically offer an upright riding position, more than any other modern bike style which is achieved by the raised handlebars. Plus with the thinner frame and a wider seat, they are more aerodynamic on roads than mountain bikes. They have wide tires, though not as far as with MTBs and without a bumpy tread. And they usually come with 18 gears. These features make them perfect for just anything you throw at them. Road bikes, as the name suggests, refer to any type of bike used primarily on paved roads. They are the most common means for commuting and running errands because they are optimized for riding on smooth pavement. Road bikes are the most common type of bike that is often confused with racing bikes. Hybrid bikes, on the other hand, are a cross between a road bike and a mountain bike that offer a mix of features of both the types. Because of their elegant design they are considered the luxury line of bicycle designs. Road bikes are distinguished by their lightweight frames and smooth tread tires complimented by dropped handlebars which make them ideal for riding on paved roads. They are lighter than other types of bicycles and usually have low bottom brackets to overcome resistance for a smooth ride. The geometry of the bike allows for the rider to lean forward in aerodynamic riding position. 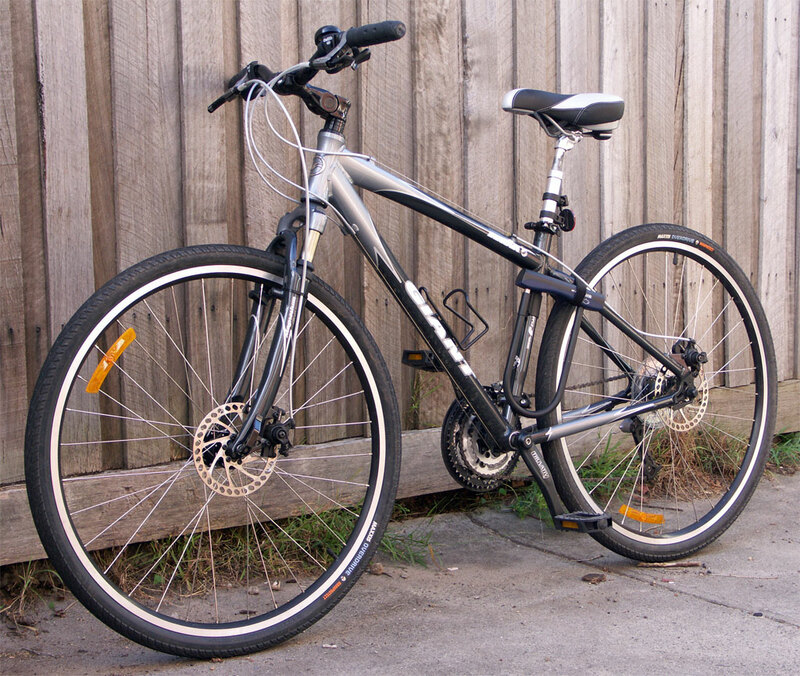 Hybrid bikes differ in overall design and frame size. Hybrid bikes are smaller in size with wider tires than road bikes but narrower than mountain bikes, making them ideal for off-road riding. Road bikes are great for long-distance commuting, racing, touring, or simply having fun on road. They are so designed to maximize speed and efficiency and thanks to the bike’s geometry, the weight of the body is evenly distributed to upper and lower extremities, providing a perfect riding position with forward-leaning. Road bikes are good for as far as you can go on paved roads. Hybrid bikes, on the other hand, provide the best of both mountain and road bikes allowing for both on and off-road riding. However, when it comes to performance against road bikes or mountain bikes, hybrid bikes do neither job exceptionally well. Road bikes are ideal for leisure rides or long-distance commuting, racing and touring. They are certainly the fastest bikes and they’re built for tarmac, Road bikes are all about fun, speed, and efficiency. They are fast-handling bikes best suited for cycling enthusiasts who seek speed and adventure. Hybrid bikes are more robust and rugged than road bikes and come with wider wheels which make them perfect for riding over grass or gravel tracks. They aren’t the fastest bike on the road but they are terribly well on off-road terrains. They offer more versatility which makes them a practical choice for casual-paced pedaling around town. In a nutshell, road bikes mostly appeal to those who seek speed and endurance for long-distance rides without worrying about getting off the roads. The bike’s geometry and lightweight design allows for maximum efficiency and greater speed. Plus the riding position is forward-leaning owing to the dropped handlebars allowing for constant speed and efficiency on the road. Hybrid bikes offer the best of both the worlds – a mix of features of both road bikes and mountain bikes. They are the premium line of bicycle designs that particularly appeal to bike commuters or for casual-paced pedaling around town. Sagar Khillar. 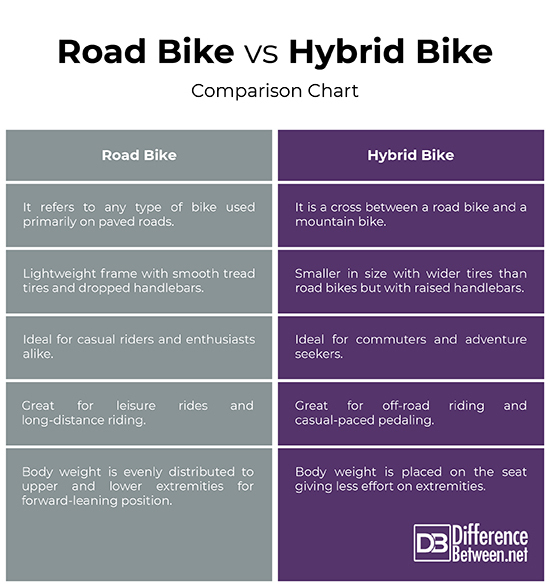 "Difference Between Hybrid Bikes and Road Bikes." DifferenceBetween.net. October 4, 2018 < http://www.differencebetween.net/object/difference-between-hybrid-bikes-and-road-bikes/ >.